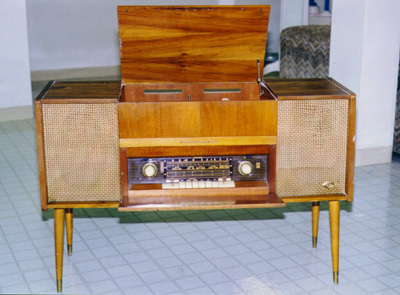 This was the unit that got me interested in German radios. It's a Grundig Majestic SO-111 US stereo console with MW/FM/SW tuners and a built-in record changer. I've been told this unit dates from the early 1960s. 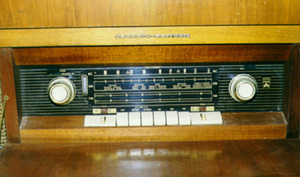 The radio portion (with its green tuning eye, seen next to the volume control on the left) operates well. Like many of its siblings, the SO-111 covers the following frequencies: 510-1600 kHz (MW); 6.0-16.0 MHz (SW); and 88-108 MHz (FM). Also a tradition with radios of this type, the tuning scale has the names of various countries listed along the dial. One interesting thing about this unit is that it has two separate tuners, one for MW/SW and the other for FM. Each tuner is engaged by pushing one of the band selector "piano key" buttons. When you look at the dial, you will notice that the pointer on the FM dial scale can be anywhere and it won't affect where you're at on MW or SW.
On the back panel, there are connections for right and left external speakers: each side has a twin banana-plug jack for 5 ohm speakers, as well as a 7-pin round jack for the "HiFi Panorama Speaker or Stereo Box." There are also two DIN connectors for connecting a tape deck- one each for mono and stereo. The set of tubes in this unit includes EL84, ECC85, ECH81, and EF89. True to all the Grundigs of the era, this radio has a warm, full sound. When you turn up the volume, you have to go pretty far before you hear any kind of distortion. One spring evening in the early 1990s I was tuned to a US-based station that programmed classic rock music over shortwave and they started playing Badfinger's "No Matter What"-- those opening guitar riffs blasted beautifully through my house from the basement, where the radio was set up! Performance on the radio bands is very good. Even with a short length of wire attached as an antenna, it can pull in the more powerful shortwave stations without a lot of trouble. For FM, I use a pair of rabbit-ears and it tunes nicely. The phonograph/changer, however, does not work very well-- it takes a little "prodding" to get it going. The finish is a light-oak veneer over wood. A little shot of Pledge went a long way, and the console cleaned up nicely when polished. The radio's two metallic emblems are in fine shape. 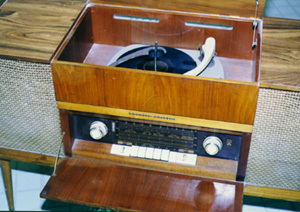 The "Grundig-Majestic" nameplate above the control panel is displayed even when the unit is closed up, and the V-shaped "Stereo" emblem on the right speaker fits with the design sensibilities of the period. You can see some contemporary pieces of this unit in this Grundig advertisement. Purchased at a garage sale in 1990 for $4.00, this was one of the best deals I'd ever run across, and was a great introduction to German radios. It was the main source of audio entertainment in my workshop until it went to its new home in Indianapolis. This unit proved that it's always worth the extra minute it takes to browse through a garage sale! Click here to return to the main radio page.